Cast in role of cheerleader-in-chief, Scottish FA president Alan McRae felt it a privilege to announce Alex McLeish as the new manager of the national team in February last year. McRae was so delighted to appoint his old chum that he went into a riff about how close the two men have been over the years. When he said that their friendship went back to the 1888-1889 season - when Jack the Ripper burst on to the scene - out came the calculators along with the mocking humour. Going by McRae's verbal blunder, he was president of McLeish's testimonial committee 130 years ago, a timeline that would have put the new Scotland manager very much in the veteran category at almost 160 years of age. This is the man who will lead us to Euro 2020, said the president. "No pressure, Alex. Over to you..."
McRae got a bit of a ribbing for that, but it was a one-day thing before the next thing arrived and then the next thing and then the next thing after that. Scottish football is a fast-moving caravan of the absurd. If we could just park ourselves in one place for any length of time something might actually get done, but we don't. Summer football, plastic pitches, strict liability, VAR. Hoary old chestnuts that drift across our landscape as thunderous talking points before another story comes along to wipe them off the agenda - until next time. It's life on a loop. A bottle thrown, coins chucked, players accosted, referees and linesmen threatened, sectarianism, racism, glorifying of the IRA. All of this happens and there's barely a peep from the football authorities in this country. If they get around to commenting then the statement is the square root of nothing at all. In the past 10 years only one club has been sanctioned for the unacceptable conduct of their supporters - a two-year probation for Motherwell. Meanwhile, Clyde, the easy target from League Two, get hammered with a points deduction and a fine for accidentally fielding an ineligible player. This is what passes for leadership in Scottish football. Big clubs get a free pass and a small club gets the Sword of Damocles. Football fans all over the nation will tell you stories about the cravenness of Scotland's governing bodies going back decades, but the weakness and lack of moral authority seems to be rising all the time. It's almost as if the national team, in their insipid performances against Kazakhstan and San Marino, has now taken on the guise of the people who run it and their colleagues down the corridor at the SPFL. 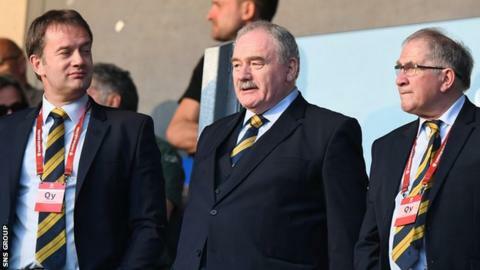 Which takes us back to McRae, vice president Rod Petrie, the man they appointed as national team manager and Ian Maxwell, the SFA chief executive, who is no doubt longing for the heat to transfer somewhere else. And it will. Celtic are hosting Rangers on Sunday. The build-up will begin any minute now. Hours of radio, acres of newsprint. The usual thing. McRae, Petrie and Maxwell will breathe a sigh of relief when everyone packs up their tents and moves off their lawn. The desperate need for leadership at the top will remain but we'll stop shouting about it for a little while - until the next time. This is bigger than McLeish. The Scotland fans are now openly in revolt against not just him but the people who appointed him and the (same) people who will appoint his successor, whenever that may be. There is little faith, little trust. There is a growing anger in places but, worse still, a growing apathy. Apathy is the killer. Fatalism. Acceptance that nothing will change therefore what's the point. That's a bad road, but plenty are on it - and no wonder. Scotland fans had to view two lamentable performances and then hear ridiculous comment in their wake. When McLeish said that Scotland had started brightly in Kazakhstan - they were 2-0 down in 10 minutes - there was an insult-to-injury quality to it. When he said on Sunday that, in terms of qualification, "it's never over this early in any competition" he was ignoring history and asking for blind faith based on, well, who knows what. Scotland failed to win their first game in the qualification campaigns for the World Cups in 2006, 2010 and 2014 and, of course, they didn't make it. They also failed to win their first game in the qualification campaigns for the Euros in 2012 and 2016 and didn't make it. Even a fast start hasn't helped. For the World Cup in 2002 they were unbeaten after six games. For the World Cup in 2006 they were unbeaten after three games. For Euro 2016 they had 10 points from a possible 15 at the start of the group and still they couldn't get through. McLeish had to talk up his team's chances but he was doing so from a position of desperate weakness and with a scant regard for what had gone before. With every syllable it became more uncomfortable listening to him. This needs to end, but once again we go back to the lack of leadership at the heart of the game. Scotland got pulverised by a team ranked 117 in the world and then toiled horrendously against the worst team in the world. Meanwhile, Northern Ireland, a nation with extremely modest resources but an excellent manager, delivered back-to-back wins against Estonia - 96 in the world - and Belarus - 78 in the world. They had four players from the Scottish Premiership in their starting line-up, which is as many as Scotland started with against San Marino. They had a clutch more on the bench, including a goalkeeper from Partick Thistle (Conor Hazard) and two 39-year-olds from Rangers (Gareth McAuley) and Hearts (Aaron Hughes). All three of the used subs against Belarus had spent time in Scottish football. The guy who got their winner was Josh Magennis, who did six years in Scotland with Aberdeen, St Mirren and Kilmarnock. Not for the first time, the performance of Michael O'Neill's team shames Scotland. Liverpool's Andy Robertson is one of the most exciting left-backs in Europe. Manchester United's Scott McTominay received plaudits for his excellence in the famous victory over PSG in the Champions League. Bournemouth's Ryan Fraser has more Premiership goals than Christian Eriksen and Dele Ali and more Premiership assists than Mo Salah and David Silva. Callum McGregor is a terrific footballer. His Celtic team-mate, James Forrest, has been outstanding. Jon Souttar has talent. Stuart Armstrong and Callum Paterson have played 50 Premiership games between them this season. Kenny McLean is playing for Norwich, the top team in the English Championship. John Fleck is at Sheffield United, the second-best team in the Championship. John McGinn is doing well at Aston Villa. Kieran Tierney will come back into this again soon. This is a promising group of players, but they're being wasted - and it's horrible to watch. Scotland should be a whole lot better than this. The booing in San Marino was heart-felt and thoroughly deserved. There is no confidence in the SFA having the gumption to change things in the short-term. The Hampden crowd will surely dwindle when Scotland host Cyprus in June. In the press conference where he referred to the beginning of his friendship with McLeish dating back to Victorian times, McRae spoke cheerily of the bright future that awaited the national team. Not many believed it then. Fewer still believe it now. For many, belief in the manager and as much, if not more so, in the people who appointed him is at an end. Meanwhile, Scottish football reverberates to the sound of men hunkering down at Hampden.